We field a lot of questions about 'bike trackers' at the Bike Index - everybody wants a small, affordable GPS tracker for their bike, but are surprised to learn that this really doesn't exist yet. Size / hideability -- It is hard to disguise a tracker so thieves can't instantly find it. And having something that uses several antennas (GPS and cellular) means they aren't easily hidden - nor are they very small. Reliance on cellular -- Most trackers use the cellular network to report their location, which means most trackers are 50% cell phone parts - and means paying for cell data, supporting a SIM card, having a hefty battery, etc. Power -- Because of #2, power is an issue. Nobody wants to constantly have to charge a tracker, but once you've gone with cellular there's really no way around this. Talking to the cell network takes a fair amount of power, end of story. For a while I was excited about the low power bluetooth trackers - especially the 'crowd tracking' capabilities, but my own tests with these have been super disappointing. And while there are a lot of smart people out there working in the bike-tracking space, most of them are just pending Kickstarters with no real product on the market. The Iota tracker really piqued my interest - yes, it's a GPS tracker, but it doesn't use the cellular network. Instead, Iota uses RF frequencies and a 'community network' of tiny base stations to report its position. This completely upends the equation I listed above, eliminating problems #1 and #3 by getting rid of #2. The results is a small, versatile tracker with a significantly longer battery life. Iota has been mostly focused on pet and child tracking, but there's obviously a lot of potential here for tracking bikes. After a week of tests with my hands on an Iota, I see a whole lot of potential for bike tracking - and hackability. I grabbed two Iotas - one for my own testing, and one for cyclist/motorcycle-riding friend of the Bike Index @larsvons, as Iota's aiming at the motorcycle market, too. Iota users get a small 'base station' to install for local coverage - Iota's website base stations cover 'up to 12 blocks from your home' but as with all things RF-related, your mileage may vary - especially in dense urban environments. Think of it like the original cordless phones - remember how much range you could get with some of those? Same thing applies here. All the Iota base stations in a location form a patchwork 'blanket' of coverage, so when your Iota leaves your home station's coverage it can still report in via someone else's base station. It's basically like a baby cellphone network - but dedicated to tracking. You can see the current coverage map on Iota's site - Iota is based in the Bay Area, so the SF coverage map is very dense, while Portland is a little patchier. Yes, Iota's coverage network is still being built - customer by customer - but you can see that it wouldn't take many more to blanket a town like PDX. Other cities - Boston, DC, Chicago - are the same: about halfway covered and growing. Bluetooth backup: The Iota also does 'crowdsourced Bluetooth tracking', meaning that if someone near your Iota is running the Iota app, it'll report its position that way - instead of using the base stations. 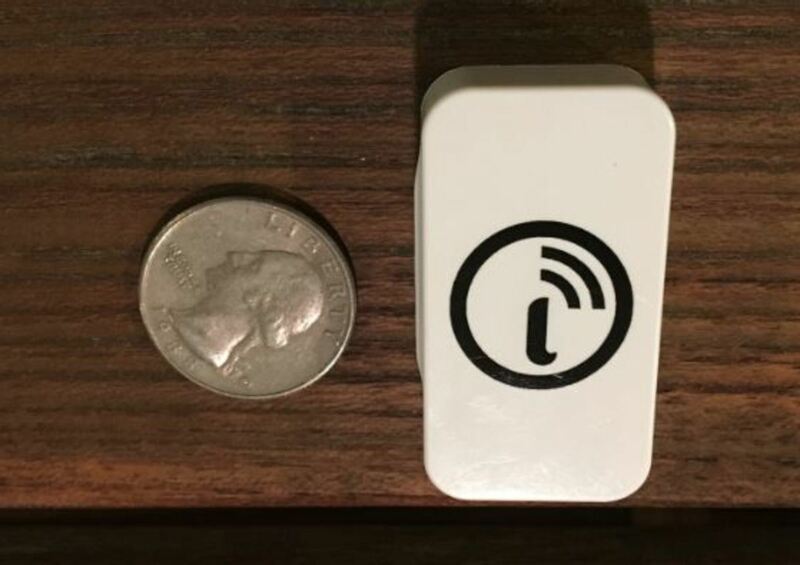 This is how most of the small trackers already on the market operate, but it's totally dependent on that nearby cellphone to be running the app, and typically only gets a few dozen feet of range under even the best of conditions. First impression? The Iota tracker is small. Really small, as you can see here. Size: At - 1.75in x .5 x 1in , the Iota looks and feels like a small domino. Battery life: I've had this tracker for over two weeks now and I've only used half of the battery! Iota promises 'weeks' of battery life, which, compared to everything else available in the tracking sphere, is a huge improvement. I haven't put this to the test yet but I wouldn't be surprised if you could squeeze a month out of a single charge, as long as you aren't tracking it that often. There's a small USB adapter provided for charging the Iota, via two small charging points on the back of the tracker. Some folks - as shown in Iota's motorcycle setup video - have already used an adaptor to provide perpetual power. You can also 'share' your Iota's location and data with another Iota user, and they can view, track, beep and operate a shared Iota just like it is their own. The app also handles 'out-of-range' scenarios well: If your Iota's out of range, you can set the app to alert you when it pops up again. I carried an Iota around for a week, testing it out its range and trackability - I'd walk various parts of Portland and test the locate, track, and beep functions, just to get an idea of how well the Iota worked in real-world scenarios. The results? Pretty good - sometimes surprisingly good. Case in point: Even while sitting on the bus - surrounded by glass and metal, moving - my Iota was getting 'hits' on the network and was trackable. Given, I was in South East Portland where there seems to be a dense cluster of base stations, but it is impressive nonetheless. There's no coverage in downtown Portland at the moment, but again, judging from the Iota coverage map it looks like Portland could be covered with a fairly small number of new base station additions. @larsvons chimed in with his motorcycle tests: "Considering motorcycles, I really just want to know if my bike is moving without me moving it (someone knocked it over, or is riding off with it). For this reason, the motion sensor function is terrific. Setting the sensitivity to "low" means that little shakes will not trigger it, and so far this has worked well. I do have to manage the alerts when I am actually moving it, but that doesn't seem too annoying yet. I have set a geofence for the same purpose, but I think the motion sensor accomplishes what I would be looking for. I have not done this yet, but pro-level hacking would be placing the tracker guts inside the seat chamber or somewhere else where I have an existing USB power port so it's easy to keep charged, and is also not obvious to thieves. The beeping and flashing would not help this but might be enough to scare someone off that sees or hears it. Overall though I think this is a promising solution to nanny your wheels." The Iota's combination of small size, long battery life, and the community-built aspect of the tracking network really makes the Iota like a great option for DIY bike tracking. Even the limited coverage doesn't worry me - We find lots of stolen bikes less than a mile away from the theft location. Another group who recently got into chasing stolen bikes told us recently that most of bikes they find are 'recovered within a 3 mile radius from where it was stolen - and thieves tend to park them in a public place.' So the Iota's combination of strong 'local' tracking via base station - coupled with the motion alerts and geofence options - have me excited about the Iota. Speaking of potential ... let's talk hackability for a sec. The street, as someone famously said, finds its own use for things - and bike folks are natural tinkerers. So, I cracked my Iota open with the idea that I'd love to hack one into a more bike-friendly form - camouflaged? Better powered? Sure - let's see what we have to work with first. As you can see the Iota's three tiny parts - circuit board, battery, antennas - are all super small, fairly modular (in the right hands), all begging for some hands-on hacking. That battery could be swapped out for a larger one fairly easily, for example, or powered off of a bike light. Or sandwiched inside a reflector. Those antennas could be worked into a stem cap. In short: Lots of potential here! Honestly the Iota hardware is so small that it looks like it could be a huge boost to someone looking to add small, low-power tracking to ... well, anything, really. And that's pretty huge. The Iota retails for $149 - that's 1 base station and 1 tracker. Which, admittedly, is a little steep for most folks, but the lack of recurring payments (for phone data) should help smooth that out for people. They aren't selling individual trackers yet, but I suspect it's in the pipeline, which would likely drop the price significantly. Thanks for reading this write-up -- I'm looking forward to watching the Iota network grow both in Portland and across the U.S.